Our entire Japan trip had been organised on the fly as we were too busy finishing off our Mallee Collection before we left and figured that we could just wing it in the same fashion that we usually travel. Japan though turned out to be less than ideal for freestyle travel - we found entire cities were completely booked out weeks in advance and at the start of our trip we were stranded in cities without beds, forced on last minute trains to neighbouring towns and even once we were forced to stay a night in a Hyatt. After spending a luxurious night nestled in our Hyatt room, sprawling on what felt like the biggest bed in Japan, we started the first of what would become many late nights hunched over our laptops, racing around the internet trying to secure lower priced accommodation and slowly plot out a trail. For the first few weeks, this became routine. Bellies full of dinnertime soba, skin soft from onsen pools or cold feet from hiking through old cedar forests and often slightly hazy from too much plum wine, regardless of the day's events, we would spend our nights cosying up to booking.com. There were places we wanted to see but these proved either too expensive or closed by the late winter snow so other places we had never heard of became our ideal travel destinations. This turned out to be for the best as we ended up in a variety of beautiful places, making up our own bento box of Japanese adventures. It was during one of these night sessions Maya remembered that picture from so many moons ago. Clumsily searching the web we found the location of the treehouse but strangely for such an iconic image, there was so little information about it. For a brief window we imagined sleeping a night aloft the treehouse, but after few minutes our research showed us this would not be possible. The treehouse was in fact a tea house, designed by Teronbu Fujimori and was well loved and over romanticised by many books showing picture perfect small houses and log cabins. From what we could find out, The 'Tetsu tea-tree house' was part of a series of art installations built for the Kiyoharu Shirakaba Museum in Hokuto City. The more we read of the small scraps of information we could find, the more we became excited. The treehouse was still standing and the art museum appeared to be open. Next door to the museum sat an elementary school that had been converted to an artist residence complete with outdoor art installations scattered through the grounds and of course there was a quaint French restaurant. The aforementioned scarcity in affordable accommodation had resulted in a hodgepodge trip from Osaka to Mashiko with two nights in Tokyo before heading north to Akita. With the two days on either side of Tokyo consumed with train travel, we had a day free - perfectly suited for a trip to track down this little tree house and hopefully top off our adventure; a meal in a strangely located French restaurant. Our train silently traversed alongside Mount Fuji dropping off the majority of passengers and climbed higher into the mountains before gliding past the snowy vineyards of Yamanashi and stopping sometime soon after. The cherry blossoms were in full bloom when we left Tokyo that morning, but seeing how much snow had fallen in Yamanashi, our hopes of seeing that tree house nestled amongst clouds of sakura now felt very far fetched. Accepting this fact, we bought some wine at the train station and a little wheel of brie to eat incase of an emergency (and also to compliment the emergency baguette we purchased in Tokyo) and boarded another train headed towards Hokuto City, which much like most other cities - lacked any available beds. Spirits were high as we puttered into rainy Nagasaka station, the closest station to both Hokuto City and the meusuem. We now realised why we could not find any available hotels around the station, because there simply wasn't any hotels or really too much of anything. Having loaded up a Google map when we changed trains, we set off in the drizzle, checking out the soba noodle shops, bars and other galleries marked on the way, finding them decrepit and looking like they had been closed for years. There were also no footpaths, so we made our way down the middle of the winding roads that also had no shoulders, scrambling out of the way of oncoming cars, as they comfortably navigated the narrow tarmac. Eventually we took the side roads and walked through a collection of beautiful little farms. Winter looked reluctant to leave, the soil still cold and hard, and even though there was no one outside nor any smoke coming from any of the farmhouse chimneys we were sure there were people about. Have you ever watched Studio Ghibli's wonderful film 'Spirited Away'? In the film, the main character and her parents stumble upon an abandoned amusement park, but come night fall the park comes to life - no spoilers happening here. Well, we have watched that film and that was exactly how we felt entering the grounds. As we walked through the grand and rusted wrought iron gates, a large circus tent shaped building stood coldly before us. We guessed it must have been the artist residency, but there were no signs and some of the windows were broken whilst others were boarded up. The cherry trees that surrounded the grounds were slightly eerie as they stood bare whilst soft rain made slow work of washing away the snow that remained. The silence was heavy, but knowing we had a backpack full of wine, bread and cheese was comforting - so we headed on in to explore. The teahouse was easy to spot standing triumphantly in the far corner, encased by the bare sprawling branches of thawing cherry trees. It too looked a little worse for wear, but it was still beautiful and fantastical as ever. Despite the weathering, it was perhaps the only comfortable looking structure in the entire grounds and also the only one that actually looked at home. There were only two other sculptures; a staircase winding two stories into nothing and a man made up of cogs with a bird made up of the same sitting merrily on his finger. We spotted the museum, and to our surprise it was open, complete with a lone man sitting quietly waiting for visitors. From what we understood, the museum has Picasso Ceramics and original Degas works but that day they were only showing ancient Japanese calligraphy. 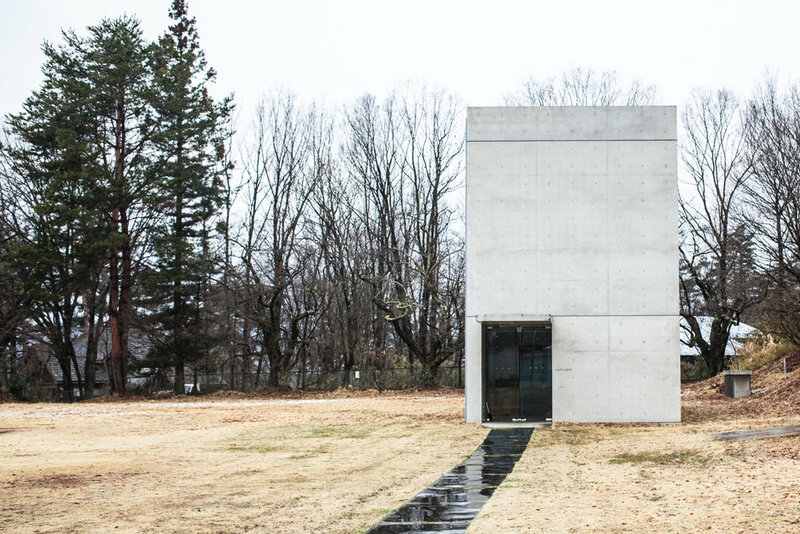 Tadao Ando had been hired by the museum to design an additional gallery, and in typical Ando style, there in the corner of the school yard stood a quite large but extremely minimal concrete cube housing only three abstract paintings. It was quite a quiet statement of architecture and in all honesty, slightly underwhelming after coming from his master piece - the Chi Chu gallery on Naoshima less than a week before, but it did add to the overall oddness of the place so it scored points. Joining the strange ensemble of mismatched art and structures was a little concrete chapel, hidden in a small pine forest - a small crucified Jesus glowing on a wall of polished concrete gazing down seemingly as puzzled as us. After wandering around in the wet for sometime, we made our way to the French restaurant - which we were surprised to see was open. The scene was strangely surreal, the restaurant was empty except for one very large man. He was quietly working through his meal without stopping for anything and the meal seemed bottomless. It was as though this entire restaurant was only open to keep feeding him all day. We glanced at a menu which we found was only intended for carnivores, so we headed back outside to the cold, found a small sheltered nook and began an emergency wine picnic whilst the big man kept the restaurant busy. Full of wine and cheese, we sat watching the rain continue to melt the snow and enjoyed the peace that oddly empty spaces offer. Japan can be such a land of contrasts, you spend the morning barely fitting on trains, struggling to walk through such dense crowds and by the afternoon you feel like you woke up after lunch in a haunted elementary school. It must have been a strange experience for Maya, having been so familiar with an idea of a place for so long and finally arriving there to find it in such a bizarre condition - but that is what travel is about. It's an excuse to experience things for yourself and make your own memories instead of living through a photo that someone else took. Finding beauty in the present reality and enjoying the moment - wet feet and all.